This morning I am reminded of the many ways I feel like I am becoming an old lady. I slept poorly and woke up with a sinus headache. The pocket in my robe is stuffed with kleenex and my hair is wild and my appearance is not a priority - NAP as a gal pal puts it. I feel like I'm ready for a "What Not to Wear" makeover on TLC. It's cold this morning, and my feet and my fingers, with some arthritis, are hurting. Or some would say it's the crappy food I've been snacking on (Dollar Store movie collection, but I never made it to the movies...). Bummer dude, but I'm undeterred. I did some exercises at home this week, and also managed a couple of walks. I feel that the "holiday"treat food splurge is winding down and my sanity around wellness is being restored. I am appreciating the subtle changes in day length, now once again I can still take my walk around 5 - during mid winter, I just couldn't get out early enough to beat the early darkness. Unlike some old(er) ladies, I have been dealing with frustrating computer problems and some anxiety over upcoming possible work situations. I need to do my work and personal bookkeeping and I've just installed a new Internet Security suite which is pretty much hanging up the computer - I can't even configure it, even the software itself hangs. Must deal with tech support today, instead of getting to my actual work. I guess I am becoming an old lady of my generation, geeky and obsessed with not running out of money before I run out of air. I hoped that being older would be a little more laid back than it has turned out to be! I seem to worry more now than ever. Maybe when Social Security and MediCare kick in I can relax a bit. Inner peace is an inside job and all that, but there is nothing like checking out your bank balance to crank up the angst. Sure, I have faith that the Universe will support me, but the bills come in pretty consistently, and w/o consistent income, hard to stay in the peaceful zone. 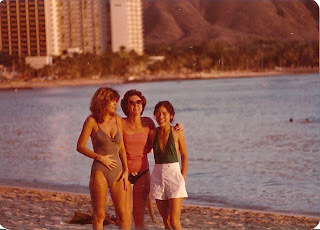 I will upload a photo that a long time friend sent me - I think it was taken around 1978 in Waikiki, Honolulu, Oahu. (I'm in the middle.) Back in the day, I didn't worry about much! Guess that's why I'm not so prepared for retirement! Unlike some old(er) ladies, especially of past generations, I'm still thinking about what is out there on the horizon for work, business, and investment opportunties. In some ways I am a slow learner and a late bloomer. And at the pace I can keep up at 60, I must not be too hard on myself. I'm doing what I need to do at this time, which sometimes feels like plodding through my life instead of enjoying it. A different chapter for sure.